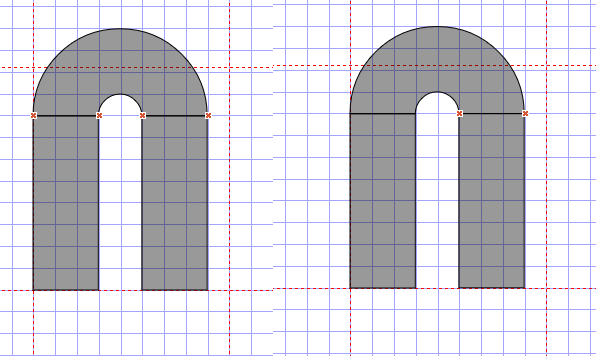 I formed the glyph on the left hand side out of the three shown shapes. Each one is an exact multiple of 100 wide, high, and in position on both axes. I then flipped the whole shape, as well as its pieces, around a couple of times, giving the right hand shape. The result, from what I did, should be identical to the original. However, two of the shapes' coordinates are now one unit off. This is noticeable if you look at the "intersection" errors shown - the left hand rectangle shape is no longer touching the half-donut shape. By enabling gridlock and then using the mouse to drag the half-donut shape around, dropping it in the same location each time, I've found that (in the pictured case) the shape will generally land correctly on (0,800), but can also end up on x=-1 or x=1, and y=799 or y=801. 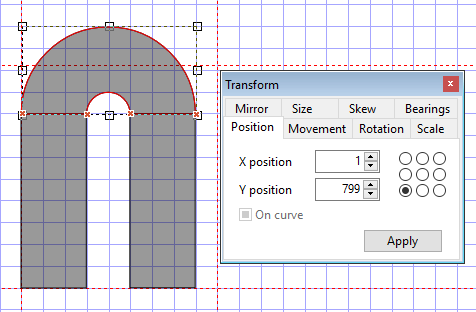 This is easy to reproduce just by keeping the Transform window open and on the Position tab, enabling gridlock, drawing a shape, and then moving it with the mouse several times. I was not able to reproduce this. A font project with the shapes would probably help. It's a lot easier to reproduce it occurring through the moving than through the rotating/flipping. I've also attached the project I used to demonstrate this to this post. I can reproduce the problem, but it is just a matter of trying again to get it to snap correctly. Erwin seems to busy doing other things as there are several unanswered topics. Hey. Was just wondering the status on this now since it's been about a month? While it is indeed quick to work around, having to perform that quick workaround about 30 times a day is getting fairly irritating. Thank you, and I do genuinely appreciate the effort put into FontCreator - it's an excellent piece of software and worth every penny. We were able to reproduce the issue, and will look into this soon. This issue will be fixed with the next upcoming release.